The difference between this kind of planning and garden planning is that grocery stores usually have whatever you want, produce-wise, whenever you want it. Gardens produce whatever is in season, whenever they happen to be ready. I just wasn’t prepared for that shift, from starting with a menu and getting whatever produce went with it to starting with the produce that I had and making a menu from that. This year, however, I was determined that things were going to go differently. I would plan ahead, searching out recipes, and adapting the recipes that I have! We would eat squash every night if necessary! Veggie soup! So far, I haven’t been perfect (a few things have gone to the compost bin), but we have actually eaten the majority of produce to come out of the garden. I want to start keeping track of what I have done and lessons for next year here, starting with mint. Several weeks ago, I started using my mint in nearly everything. There was so much, and I didn’t want to waste any of it, because it is really good stuff! I made mint juleps, and sweet mint tea, Lebanese lentil salad and tzatziki-like herbed dressings, herbed chopped salads and mojitos. All of this did use up a lot of mint during the growing phase, but once all the mint started flowering and reaching the end of the season, I needed to do something fast, with a LOT of mint. A quick search of the internet quickly led to a list of liqueur recipes, and I was hooked. It is the perfect way to use a lot of mint, and I can give some of the results away for Christmas presents, not to mention having some homemade liqueurs right here at home. Unfortunately, I also found a lot of other liqueur recipes that I am making with things not from the garden, but that is a story for another time. I settled on this recipe, and started it once as stated, but that barely even touched the huge amount of mint out there. Clearly, more drastic measures were needed. As you can see, some of the leaves don’t look so good, but much of it was usable. I got about 5 ½ lightly packed cups of mint leaves out of this mound. I stood at the sink for probably 2 hours or maybe a bit more, broken up into two stretches, pulling leaves off the stems, washing them, spinning them in the salad spinner (as an aside, the garden has changed my salad spinner from a slightly expensive indulgence--I used to buy pre-washed produce all the time--to an almost daily use kitchen gadget, which I think is pretty cool,) and making mint syrup and more mint liqueur. For the mint syrup, I brought three cups of water and 1 ½ cups of mint to a boil, then added about 2 ½ cups of sugar. I let that return to a boil, stirring, then turned the heat down, put a lid on the pot and simmered for about five minutes. Then I runed off the gas, took off the lid, gave it a quick stir and left it to cool and steep. When I got back around to it, I drained the syrup through a colander to remove the mint leaves, put a lid on the bowl and stuck it in the fridge. We are going to get some vanilla ice cream today to have with this, and I may make some tea with it, or maybe some lemonade. I made lavender lemonade with a sugar syrup infused with dried lavender flowers and fresh lemon juice recently, and the kids loved it, so mint lemonade may be a hit, too. I could have started liqueurs long ago. While the mint was going strong, anything I took off came back within days, and it was all fresh and healthy. I would still do this end of season thing, but I could have gotten a lot more out of my mint if I had used it more at the beginning. I need to look into drying some of these herbs. I assume I just need to get some kitchen twine and tie up a bunch in the basement, but I need to look into specifics. I got more mint this year than last year, and chances are I will get even more next year. I need to start saving all glass jars that I use during the year. I can save a lot of things in jars. I could use even more minty recipes. Overall, I know I did a much better job using the mint this year than I did last year. 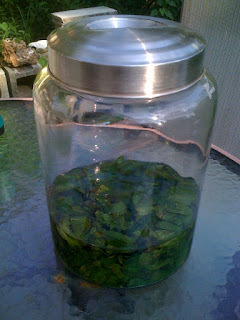 I am very excited about my homemade mint liqueurs, and I cannot wait to give them to my friends for holiday presents. Now I just need to see if cutting back the mint now leads to another crop in the fall. 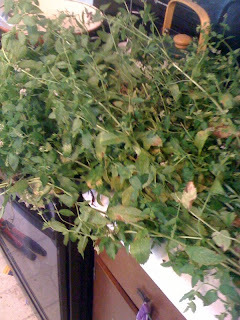 I am hoping that it will, but if not, I know that I will be better prepared to use even more of the mint next year. I am calling this one a definite success! That sounds really yummy! I have never been able to get mint (or anything really) to grow well in my garden. Part of it is too much shade. But I have a spot on the side of the house I thought would be perfect for tough mint - no luck. Hopefully I can try some of your yummy mint liquor one day! Absolutely, Hilary! When my mint comes back, you are welcome to use some, too--there is a lot of it.